to experience the province’s cultural highlights, and his hotel showcases a representative collection of works by Taranaki and New Zealand artists. 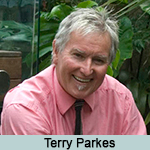 A past president of Jaycees, Terry is actively involved in promotion of the New Plymouth business community, including sponsorship of business awards through the Chamber of Commerce. He is a civil union and funeral celebrant, donating all his fees to local charities. Terry is a devotee of the works of Len Lye, believing New Plymouth very fortunate to hold the collection of the internationally renowned artist, and has incorporated an image of Lye’s Wind Wand sculpture in his hotel logo. “With the Govett-Brewster Art Gallery and the Len Lye legacy the district has a sound base on which to build a public art programme that will enrich and enliven our district for residents and visitors alike,” says Terry. 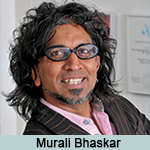 Although born and raised in India, architect Murali Bhaskar is now a New Zealand Citizen, and committed Taranakian, having been resident in New Plymouth some 17 years. A partner in one of the city’s foremost architectural firms, Boon Goldsmith Bhaskar Brebner Team Architecture, he finds the landscape and people inspiring. “My work has indelibly rooted me in New Plymouth, and given me the opportunity to grow both my architecture and the city. It is not often an architect gets to be part of a city that is growing and punching significantly above its weight,” says Murali. He believes there are many commonalities between Art and Architecture, and in his own practice actively seeks to blur the boundaries. Boon Goldsmith Bhaskar Brebner Team Architecture has always been committed to the arts and community and plays an active role as sponsors/supporters of various cultural and artistic events that New Plymouth is known for including WOMAD, Taranaki Arts Festival, Govett-Brewster Gallery, Arthouse Cinema and Duffy Books in Schools. “I believe we can make New Plymouth an even better places to live through inspiring accessible creativity, not just on the waterfront, but throughout our community,” says Murali. 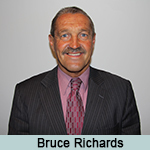 A director since 1987 and deputy chairperson of the TSB Bank, Bruce has been involved with a wide range of community interests since he arrived here from Auckland in 1967, working until his recent retirement as a director of Staples Rodway Accounting . Among attractions which drew him here were the mountain and surf, providing plenty of opportunities for his love of skiing and surfing. He has served those sports well, at one stage becoming president of the Stratford Mountain Club, of which he is now a life member, and assisting both the New Plymouth Board Riders Club and Surf Taranaki in volunteer roles. Not surprisingly, his three children who were raised here are keen on surf and snow sports. Bruce was a trustee on the Taranaki Rescue Helicopter Trust, and for nine years he served on the board of the Taranaki YMCA. His diverse interests also led him to becoming a foundation trustee of the Taranaki Festival of Arts, a position he still holds. With those and commitments to many other community activities it is easy to understand why he was awarded the NZ Order of Merit for services to the community in 2007. “I love New Plymouth and I feel there is a lot we can do to enhance public areas with art works. Our walkway with some of the stone sculptures, the wind wand, and the John Reynolds ‘Big Wave Territory ‘ signpost is an example of the sort of work Art in Public Places Trust wants to promote,” said Bruce. 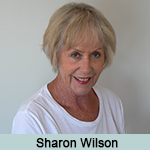 A former journalist, Sharon has worked in print, radio and television both in New Zealand and overseas, including early career stints with Taranaki Daily News and Radio Taranaki. In Auckland she moved into public relations and marketing, working both in-house and as a consultant to a variety of corporate organisations, including Watercare Services, Auckland City Council and Tourism New South Wales. Her interest in art then lead her to becoming owner/ director of one of Auckland’s longest established galleries, Flagstaff Gallery in Devonport. Most of the artists selling through the gallery were full-time professionals, some with international standing in their fields, which covered painting, printmaking, sculpture, pottery and glass works. In earlier times Sharon was publicist for the Govett-Brewster Gallery, at a time when the Len Lye collection was in its infancy, was on gallery’s friends committee, and she was founding publicist for the Taranaki Festival of Arts. Sharon and husband Nigel returned to New Plymouth to live three years ago, and are again enjoying the lifestyle the district offers, and reconnecting with old friends and acquaintances. Through the work of the Trust Antony is keen to foster a greater engagement with art by both Taranaki residents and visitors. “New Plymouth has earnt an enviable position as a creative and innovative city. Adding spectacular and inspiring artworks in accessible as well as unexpected locations should further add to the vibrancy of our community,” he says. His previous roles have included marketing and communications roles for the Minister of Arts, Culture and Heritage, the Prime Minister’s office, and the Govett-Brewster Art Gallery as well as consultancy work for artists and art galleries. 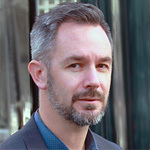 He is currently Communications Manager for Venture Taranaki. Antony lives in New Plymouth with his wife, art dealer Catherine Rhodes, their young family, and an expanding art collection.